Six years after the end of World War I Congress enacted a bill that would reward veterans of the conflict a cash bonus for their service. However, the legislation stipulated that the veterans would not collect their bonus until 1945. This delayed gratification was acceptable to the World War I veterans during the prosperous '20s but the onslaught of the Great Depression changed their attitude. Out of work, destitute, and with families to feed, the veterans organized a march on Washington in May of 1932 to force Congress to immediately pay their bonus. 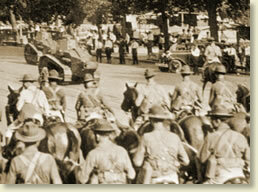 An estimated 15,000 made their way to the nation's capital and dubbed themselves the "Bonus Expeditionary Force." Using scrap wood, iron and any other loose materials they could find, the veterans set up ramshackle camps throughout the city. The largest housed an estimated 10,000 people. They waited in vain for Congress to act. On June 17 the Senate voted against the House-passed bill that would have given the Bonus Marchers immediate payment of their benefit. Having no other place to go, the majority of the Bonus Army remained encamped in the city, despite the fact that Congress had adjourned for the summer. Finally, President Hoover ordered the Army to forcibly remove the veterans. On July 28 a force of tanks and cavalry under the command of General Douglas MacArthur stormed the camps and drove the veterans out. Their makeshift houses were then set ablaze. "I was horrified to see plain evidence of hunger in their faces." "On a day in June, 1932, I saw a dusty automobile truck roll slowly past my house. I saw the unshaven, tired faces of the men who were riding in it standing up. A few were seated at the rear with their legs dangling over the lowered tailboard. On the side of the truck was an expanse of white cloth on which, crudely lettered in black, was a legend, BONUS ARMY. Other trucks followed in a straggling succession, and. on the sidewalks of Massachusetts Avenue where stroll most of the diplomats and the other fashionables of Washington were some ragged hikers, wearing scraps of old uniforms. The sticks with which they strode along seemed less canes than cudgels. They were not a friendly-looking lot, and I learned they were hiking and riding into the capital along each of its radial avenues; that they had come from every part of the continent. It was not lost on me that those men, passing anyone of my big houses, would see in such rich shelters a kind of challenge. I was burning, because I felt that crowd of men, women, and children never should have been permitted to swarm across the continent. But I could remember when those same men, with others, had been cheered as they marched down Pennsylvania Avenue. While I recalled those wartime parades, I was reading in the newspapers that the bonus army men were going hungry in Washington. That night I woke up before I had been asleep an hour. I got to thinking about those poor devils marching around the capital. Then I decided that it should be a part of my son Jock's education to see and try to comprehend that marching. It was one o'clock, and the Capitol was beautifully lighted. I wished then for the power to turn off the lights and use the money thereby saved to feed the hungry. When Jock and I rode among the bivouacked men I was horrified to see plain evidence of hunger in their faces; I heard them trying to cadge cigarettes from one another. Some were lying on the sidewalks, unkempt heads pillowed on their arms. A few clusters were shuffling around. I went up to one of them, a fellow with eyes deeply sunken in his head. 'Have you eaten?' He shook his head. Well, he called the manager into the conference, and before long they were slicing bread with a machine; and what with Glassford's coffee also (he was spending his own money) we two fed all the hungry ones who were in sight. ...One day Waters, the so-called commander, came to my house and said: 'I'm desperate. Unless these men are fed, I can't say what won't happen to this town.' With him was his wife, a little ninety-three-pounder, dressed as a man, her legs and feet in shiny boots. Her yellow hair was freshly marceled. I thought a bath would be a welcome change; so I took her upstairs to that guest bedroom my father had designed for King Leopold. I sent for my maid to draw a bath, and told the young woman to lie down. Her lip was out, and so I did not argue. She threw herself down on the bed, boots and all, and I tiptoed out. Charlie Curtis told me that he was calling a secret meeting of senators and would send a delegation of them to the House to urge immediate action on the Howell bill, providing money to send the bonus army members back to their homes." Evalyn Walsh McLean's account appears in: Father Struck it Rich (1936); Daniels, Roger, The Bonus March; an Episode of the Great Depression (1971). 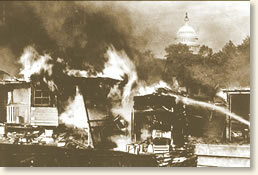 "The Bonus Army Invades Washington, D.C., 1932," EyeWitness to History, www.eyewitnesstohistory.com (2006). The eccentric Evalyn Walsh McLean was the owner of the Hope Diamond from 1911 until her death in 1947. The diamond is now part of the collection of the Smithsonian Museum of Natural History.